We can probably agree that there’s nothing cuter than a baby’s toothless grin. It’s a pure form of joy that hardly any child or adult can resist its charm. New parents are often confused about what to look for or expect in the various growth stages of their little ones. Dental development milestones are some of the most crucial of these growth stages. 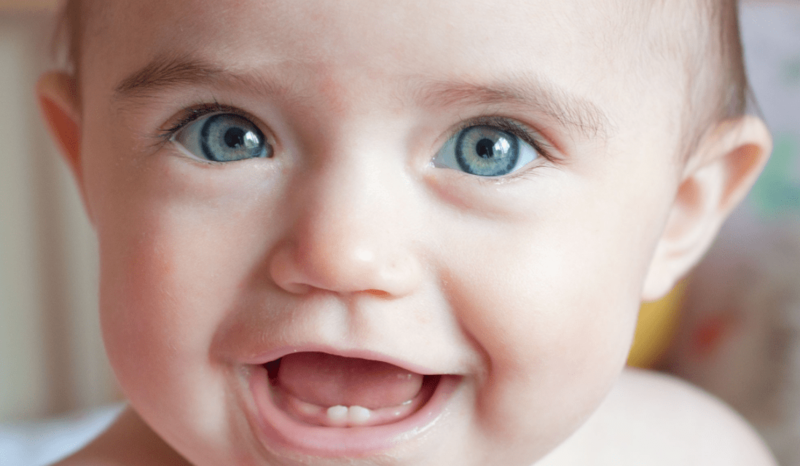 Did you know that even before the baby was born, some little tooth buds were growing under the gums? It’s usually not after some time later that the teeth begin to break through, which marks one of the several milestones of a child’s dental development stages. In this article, we’ll talk about what moments to look for, and how you should address them as they arise. However, keep in mind that this is a rough guideline. Teething begins within the first four to seven months, where the first tooth marks the way for future dental checkpoint. Sometimes, the first tooth may erupt as early as the first 3 months, while in others is could take up to a year. The two front teeth on the lower jaw are usually the first to make an appearance. These are then followed by the two front teeth on the upper jaw, and the surrounding teeth follow. Molars are the last to develop, and you can expect them at around 12 to 32 months. During this time, the baby might have it quite tough, since the eruption of new teeth is likely to cause some discomfort. To help ease the pain, you can rub their gums gently with a cool teaspoon, or with your clean finger. In case this doesn’t work, consult your dentist in Sydney for other alternatives. Be sure to keep a keen eye on fever, as this could be a sign of an infection. According to the American Dental Association (ADA), quality dental care regimen should start as soon as the first tooth erupts. This will play a huge role in the overall dental health of the child later in life. The baby teeth are very essential as they help with speech development and make space for permanent teeth, they should be maintained too. This is the second milestone of your child’s dental health �” starting to clean and brushing teeth. You can start with the use of a clean wet cloth, wiping down their gums to get rid of any material left over. You can then try a soft bristle toothbrush with water when more teeth have come through. Make sure that you talk with your dentist about the best time to stop using a bottle. Discourage finger or thumb sucking, as this can affect the growth of the mouth and the teeth. The first visit to the dentist should be about 6 months after the eruption of the fist tooth, which is typically around the age of one. In this appointment, the dentist examines the jaw, gums, and teeth of your child, to identify if there are any abnormalities, and to ensure that the dental development is on track and healthy. Since every child will develop at different rates, this appointment is crucial as it helps you learn all the tips and ideas for proper dental care specifically for your child. The next major dental milestone is when your child loses their first baby tooth, as they begin to usher in the permanent teeth. Children usually begin losing their baby teeth as early as 6 years of age, and all the baby teeth should be lost by early teenage years. Keep in mind that the mixture of baby and permanent teeth will produce a mixed dentition, which require some special care too. The whole process from the appearance of the 1st baby tooth to the growth of the 1st permanent tooth takes around 6 years or more. Good dental habits should be maintained and even emphasized at this point, since the permanent teeth should last the child throughout the rest of their lives. Good oral health habits from this stage can set the child up for healthy gums and teeth even later on in their lives. So, it’s vital to instill a good proactive approach now. For instance, many kid will be playing sports during this time of their life. So, ensure your child wears the proper protective gear such as a fitted mouth guard to protect their new teeth. Instilling a good flossing and brushing routine is best done early on. It’s also important to watch the diet, since many kids are fond of sugar during this time, and exposing them to too much of it can damage their adult teeth permanently. Once all of the adult teeth have come out, it’s important to fix any dental issues early on. Issues such as overlapping, overcrowding, or misalignment of teeth need to be corrected with braces or Invisalign, typically at around age 12 to 13 years. If they need this treatment, make sure that they get it, since crowded, crooked, or misaligned teeth can lead to problems like tooth decay and uneven teeth wearing in the future. It’s important to keep up and monitor the oral hygiene habits of your child through the teenage years to prevent the onset of cavities and gum disease. The eruption of the wisdom teeth is the final milestone of your child’s dental development. Wisdom teeth are the farthest rear back molars, which usually appear at around ages 17 to 25 years. Keep in mind that over 85% of people usually have their wisdom teeth removed, since they affect the surrounding jaw and teeth. Your dentist will monitor the growth of the wisdom teeth, and establish if the growth of the third molar will should be allowed or stopped to prevent future complications. The dentist should also recommend a proper nutrition, diet, exercise, and good oral care habits such as flossing, brushing, and the use of fluoride products to keep a good oral health. The dental development of every child is unique, so you need to watch out for any of these milestones as specific for your child. When each of them is close, you can book an appointment with a kids’ dentist in Sydney, to make sure it’s a smooth process, and that your child maintains good oral health. If you have any questions or concerns about the dental development of your kid, don’t hesitate to call your dentist today.